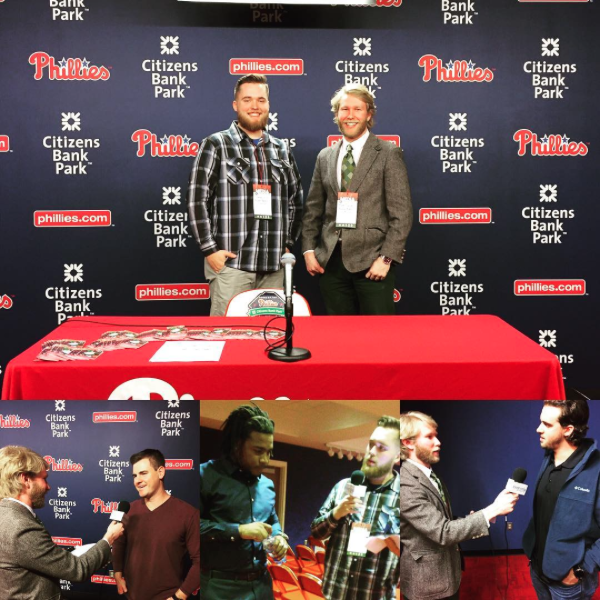 Members of Rowan Radio WGLS-FM had a special opportunity to practice their broadcast interview skills on star players of the Philadelphia Phillies at Citizens Bank Park on Thursday. Starting pitcher Aaron Nola, third baseman Maikel Franco and first baseman Tommy Joseph were present in the Phillies Media Room to offer one-on-one interviews with college students as a part of a College Media Availability event on January 19, hosted by the Phillies organization. Kyle Thomas and Thomas Wis of Rowan University were two of the 15 students from area colleges like Temple University and West Chester University who were able to chat with the Phillies superstars. Approaching the Phillies came with extra nerves for Thomas and Wis.
Alongside the interview opportunities, members of the Phillies promotional staff gave the students a first look at some of the official Phillies items to be given to patrons for free at select games this season, including knit caps for Opening Day (April 7, vs. Washington Nationals), texting gloves and Hawaiian shirts for Father’s Day. Franco, who is becoming a perennial star at third base, told the students he looked to improve his power numbers after leading the team in RBI’s and slugging percentage last season. When it came to defense, Franco said he believes he can play well enough to win a Gold Glove Award this season. Joseph, the new everyday first baseman after the departure of longtime Phillie Ryan Howard, told the students that the torch being passed to him is no added pressure, and that he wants to help take the team to the next level. At the end of the interview sessions, members of the Phillies’ public relations staff took recommendations on how they could improve the gameday experience, especially for college students. Some suggestions asked for more college ticket discount opportunities and one-day-only flash sales. Wis found the experience comforting as he prepares for his future career. By the end of the week, Wis and Thomas’ interviews will be available to listen to on A Community Affair and their professional sports show Offsides. They are also writing a story for the radio station’s blog.